Genesis 11:1--9 speaks of the purpose of building the Tower of Babel, man’s rebellion against the LORD God and the Ancient Babylonian Mystery Religion. When the flood waters had receded and the water had dried up from the earth, Noah and his family emerged from the ark along with all of the animals. Noah, a man of righteousness, in obedience had built the ark. When he emerged from the ark, using stones, the first thing Noah built was an altar to the LORD. Noah took some of all the clean animals and clean birds and sacrificed burnt offerings on it. The LORD was pleased by the aroma of the sacrifice and promised to never again destroy all living creatures (Genesis 8:20-21). The altar of sacrifice was not to be made from hewn or polished stones. The altar was not to be ornate and comprised of dressed stones or made from bricks but made from what God provided naturally. Otherwise, men might attribute the atonement provided on God’s altar to the work of their own hands. Bricks are uniform and indistinguishable from one another. Whereas, stones are unique in shape, size and color. Bricks need mortar to hold them together. Stones can be fitted together without mortar. Jerusalem’s first and second temple both were built from large stones fitted together without mortar. As stones of various size and shapes were fitted together to build the temple in Jerusalem, individual believers in Messiah Jesus with their unique looks, personalities and gifts are being built into a spiritual house. We are fitted together without mortar so that we must not only lean upon one another but hold up each other as well. The followers of Nimrod, whose name means the “Rebel,” or literally, “Let us Rebel,” made bricks in order to build a fortified city and a tower to reach to the heavens. As recorded in Genesis chapter one, are the first words God spoke to Adam and Eve. After God blessed them, they were commanded not only to be fruitful but to fill the earth with their offspring. In disobedience to God’s command give to Adam and Eve, and later reiterated to Noah and his sons to multiply in number and fill the earth, rebellious men desired to build a city. Their wicked intention was to purposefully disobey God by clustering together in a city and therefore avoid being scattered over the face of the earth. In their pride they declared that they would make a name for themselves by building a tower that reached to the heavens. The Tower of Babel was thought to have been a ziggurat. A ziggurat is a temple used by the ancient Babylonians and Assyrians. The word ziggurat comes from an Akkadian word meaning “to build on a raised area or platform.” These ancient Mesopotamian temple towers consisted of a lofty pyramidal structure built in successive stages with outside staircases and a shrine at the top. The intension concerning the proposed height of the tower of Babel was not to literally reach up to the heavens, but that it should be raised exceedingly high. Hyperbole is the use of exaggeration as a rhetorical device or figure of speech. Like the cities in Canaan, said to be walled up to heaven according to Deuteronomy 1:28, the tower was to be the tallest manmade structure of its day. The purpose of building this tower was to erect a temple to the host of heaven for the worship of the sun, moon and the planets. The worship of the sun, moon, stars and planets is perhaps the oldest form of idolatry practiced by ancient peoples. Moses sternly warned the Israelites against worshiping the host of heaven as was the religious practice of the surrounding pagan nations. Titus Flavius Josephus, also known as Yosef Ben Matityahu, was a Jewish historian in the first-century A.D. He witnessed the destruction of Jerusalem in A.D. 70 and recorded the events. His two major works are The Jewish War and The Antiquities of the Jews. The first tells the story of the Jewish revolt against the Romans from A.D. 66 to 70. The second is a history of the world from a Jewish perspective. “Now it was Nimrod who excited them to such an affront and contempt of God. He was the grandson of Ham, the son of Noah, a bold man, and of great strength of hand. He persuaded them not to ascribe it to God, as if it were through his means they were happy, but to believe that it was their own courage which procured that happiness. He also gradually changed the government into tyranny, seeing no other way of turning men from the fear of God, but to bring them into a constant dependence on his power. He also said he would be revenged on God, if he should have a mind to drown the world again; for that he would build a tower too high for the waters to reach. And that he would avenge himself on God for destroying their forefathers. When Nimrod died, the Babylonian mystery religion in which he figured prominently continued on. His wife Queen Semiramis saw to that. Once he was dead, she deified him as the Sun-god. Later, when this adulterous and idolatrous woman gave birth to an illegitimate son, she claimed that this son was Nimrod reborn. Semiramis named her son Damu (from the Sumerian “dam,” or blood), which in the later Babylonian language became Dammuzi, in Hebrew Tammuz, and in Greek Adonis. Semiramis claimed that her son, Tammuz was supernaturally conceived. She declared that she had been visited by the spirit of Nimrod, who left her pregnant with the boy and that he was the promised seed, the “savior” that was promised by God in Genesis 3:15. However, not only was the child worshipped, but his mother was also worshipped as much (or more) than the son. Nimrod was deified as the god of the sun and father of creation, while Semiramis became the goddess of the moon and fertility. In the old fables of the Mystery cults, their savior Tammuz, was worshipped with various rites at the Spring season. According to the legends, after he was killed by a wild boar, he went into the underworld. But through the weeping of his mother, he mystically revived in the springing forth of the vegetation. Each year a spring festival dramatically represented his supposed “resurrection” from the underworld. The LORD God is omniscient (all knowing) and omnipresent (all present). He did not have to come down to gain information that He did not know. Yahweh came down to reveal His presence and power to mankind. The phrase, “let us go down” is another biblical proof of the triune nature of the Godhead. As men were scattered over the face of the earth speaking different languages, they continued in their worship of the sun, moon and other heavenly bodies. Therefore, the same mythical gods and goddesses they worshipped were called by different names based upon the language that was spoken. In various cultures Nimrod later became known as Baal, the Great Life Giver, the god of fire, Baalim, Bel, Molech, etc. Baal (sun worship) was the chief male deity of the Canaanites, Zeus the chief deity of the Greeks and Jupiter the chief deity of the Romans. Semiramis became known as the “Queen of Heaven,” and was the prototype from which all other pagan goddesses came. Semiramis is the name of the moon goddess for the Assyrians. Ashtorah is a moon goddess for the Canaanites. Isis is the Egyptian name. Ishtar is the Babylonian name. Artemis was worshipped by the Greeks and known as Diana by the Romans. Today the ancient Mystery Babylonian religion not only infiltrates into the Eastern mystic religions, but was practiced by apostate Israel and is a major influence in Islam which is the worship of the moon god Allah and in Roman Catholicism which has many elements that symbolize the sun god. The Holy Roman Emperor Constantine rejected the seventh day Sabbath for the venerable day of the sun. The Roman calendar which names its days and many of its months after pagan gods is a solar calendar. Semiramis and her son were worshipped as "Madonna and child." As the generations passed, they were worshipped under other names in different countries and languages. Many of these are recognizable: Fortuna and Jupiter in Rome; Aphrodite and Adonis in Greece; and Ashtoreth/Astarte and Molech/Baal in Canaan. In Catholicism, Mary, the Mother of Jesus is known by many titles, including the Blessed Virgin Mary, Queen of Heaven, Theotokos (Mother of God) and Our Lady (Notre-Dame in French; Madonna in Italian). After the middle of the fourth century the Roman Catholic Church transformed the “mother of the Lord” into the mother of God, the “humble handmaid of the Lord” into the queen of heaven, the “highly favored” into a dispenser of favors, the “blessed among women” into an intercessor above all women, the redeemed daughter of fallen Adam into a "sinless holy co-redeemer." There are shrines, feast days, miraculous medals, churches and societies dedicated to Mary, the perpetual virgin. Ten “Hail Marys” are said for every “Our Father” when praying the rosary. The Catholic doctrine of the “Immaculate Conception” is the belief that Mary was “sinless” from the moment of her conception. If Mary was without sin, then she would not die. Therefore, the doctrine of the “Assumption of Mary” would necessarily follow. Catholic tradition teaches that Mary left this world without dying for God can do what He wills. Then she was simply transferred to eternal glory. Although neither of these two doctrines have any basis in Scripture, they became the foundation which led to the acceptance of Marian Apparitions. There are claims that the Blessed Virgin Mary appeared to several visionaries over many years all over the world. 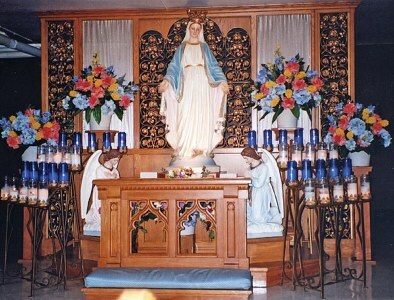 These visible sightings are known as Marian Apparitions. Today Catholic pilgrims travel to these places to be strengthened, blessed and healed. Countless pilgrims have journeyed to sites where the Virgin Mary appeared and have been blessed with an abundance of graces in the form of healings, visible miracles and conversions of the heart. At some of the sites there are still regular appearances of Mary. Elevating the handmaid of the Lord to the title and position of the Mother of God who is the Mediatrix of all Graces is deceiving multiple millions into the worship of Madonna and child. The Marian Apparitions are demonic deceptions. She refers to your sister church. The great city in Mesopotamia was in ruins and ancient Babylon was mostly a desert in the first century. It is generally agreed that “Babylon” in 1 Peter 5:13 is a cipher for the city of Rome. There was a reason for connecting the Babylonian and Roman empires, because the Roman legions like those of Babylon at an earlier time destroyed the temple and Jerusalem. The topography or terrain that marks the geographical location of the center of the false religion is noted for its seven hills. The Whore of Babylon is a religious system that is characterized as prostituting itself. Spiritual fornication is idol worship. The Empire of the Caesars had its capital in Rome which was built on seven hills and was well-known for its many statues of its Roman gods and goddesses including the Caesars. Julius Caesar as Rome’s Pontifex Maximus held supreme religious authority in Rome. He was not only the ruler of the state but the high priest of the pagan Roman religion. The term “Pontifex Maximus” is applied to the high priest of the Roman Catholic Church today. According to the Catechism of the Catholic Church, Second Edition: 'For the Roman Pontiff, by reason of his office as Vicar of Christ, and as pastor of the entire Church has full, supreme, and universal power over the whole Church, a power which he can always exercise.” Not only does the Pope continue under the titles of the Caesars of Rome but claims to be the Vicar of Christ on earth. The Pope claims to be authorized to act as the substitute or agent of Christ on earth. Jesus himself promised us that He would send the Holy Spirit to act on his behalf and not a fallible man. As Christ Jesus had been the Master, Counselor and Guide to believers, He promised to send the Holy Spirit as His substitute so that He might abide with them forever (John 14:16). The ancient Babylonian Religion that began at the Tower of Babel will be a vehicle for the Antichrist in these last days. The Ecumenical Movement will fulfill the motto that was adopted at the Ecumenical Assembly held in Amsterdam in 1948 – “ONE WORLD -- ONE CHURCH,” when the apostate Protestant churches of the world merge with the Roman Catholic Church.